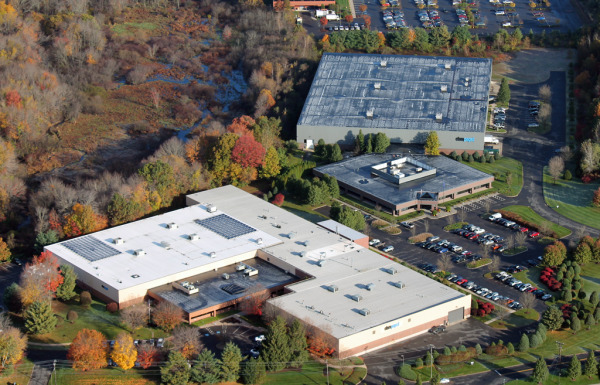 ebm-papst Inc. has recently replaced all the heating and cooling units in the main production areas at the U.S. headquarters in Farmington, CT. The units that were removed were mostly installed in 1998. Originally, we had only one gas fired central heating system in the assembly area (circa 1985) and one more gas fired central heating system in the sheet metal area (circa 1994). We added 9 separate air conditioning units in 1998. The decision was made to replace 10 of these units with combination heating and cooling units that utilize the existing roof penetrations. We selected the highest efficiency model available in the 20 ton size. The project was completed during the final two weeks of October – including all the new natural gas line piping, rigging of the old units off the roof, and installation of the new high efficiency units. We also added an Energy Management System (EMS) that allows for direct communication, regulation, and temperature adjustment of all the units. They are all connected in a machine network that is subsequently controlled through a single PC setup on our LAN system. Also recently added was an emergency backup system that consists of two small generators for both buildings. These generators are hard wired into the building electric supply and sense when there is a loss of main power, then start up automatically and provide backup power to certain key systems. They also shut back down automatically when power returns. They also self-test themselves by starting up and running some diagnostics once a week – just to be certain that they are functioning correctly. Both generators (one outside the warehouse and one outside the factory) are fueled by natural gas. The natural gas services are hard lines coming into both buildings and flow gas under all conditions – regardless of utility power status. The services covered by this tandem generator system are the site computer systems, phone systems, building alarm systems, and electronic building door locks. We have also added some fork truck charging and also some lighting for the warehouse. While they are not designed to run a laser cutting machine or a punch press, the thought is that they would allow us to continue to operate at the most basic levels during an extended outage period.